Schepers, P. et al. (2017) ‘The Dutch road to a high level of cycling safety’, Safety Science, 92(Supplement C), pp. 264–273. doi: 10.1016/j.ssci.2015.06.005. Van Goeverden, C. D. and Godefrooij, T. (2011) ‘The Dutch Reference Study: Cases of interventions in bicycle infrastructure reviewed in the framework of Bikeability’. Available at: http://resolver.tudelft.nl/uuid:cc6d7d3b-6ebf-4ef7-a57c-2d4834bafe9d (Accessed: 4 October 2017). 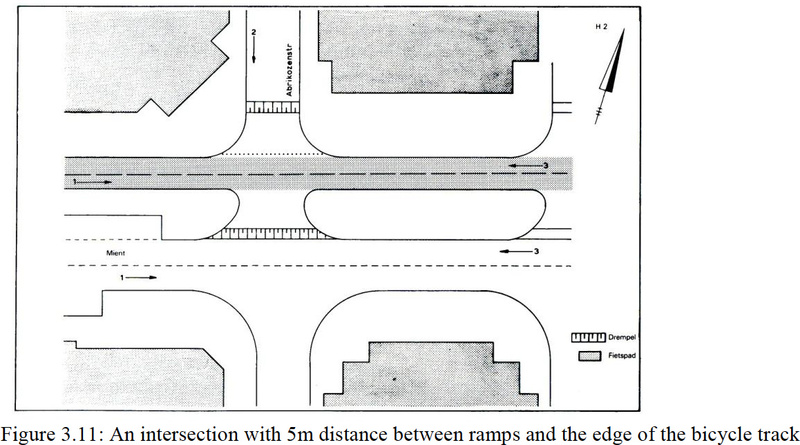 As car drivers would slow down anyway when approaching the main carriageway, the deceleration was larger in case of the hump or table crossing. But the most significant effect was the location of the deceleration. Without a speed hump the cars would slow down just before the main carriageway, whereas in the case of the road hump or table crossing with the bicycle route they would slow down before crossing the bicycle route. Having the ramp 5 m before the edge of the bicycle route had significantly better effects than having the ramp just at the edge of the bicycle route. So the effect of the humps was that car drivers will slow down more and earlier.